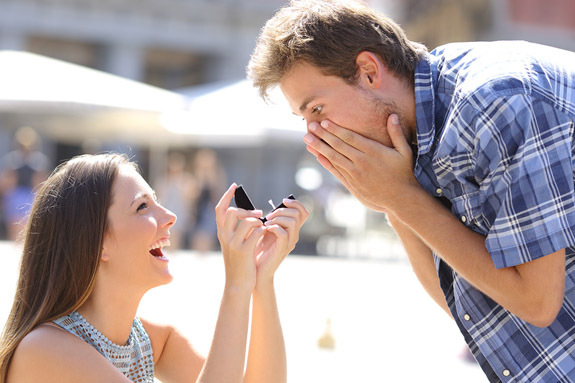 Get ready for some romantic Leap Day role reversals, as single ladies from coast to coast get down on one knee and propose to the men of their dreams. For more than 1,500 years, February 29 has been reserved for women who have waited far too long for their men to pop the question. The concept of women proposing to men on Leap Day has its roots in 5th century Ireland when St. Brigid of Kildare forged a deal with St. Patrick to permit women to propose to men every four years. In Ireland, Leap Day is also called Bachelor's Day. Apparently, this Irish traditional was then brought to Scotland by Irish monks. Legend states that in 1288, the Scotts passed a law that allowed women to propose on Leap Day. If the man refused the proposal, he would have to pay a fine, ranging from a kiss, to a silk dress or a pair of gloves. In upper-class circles, the fine for a proposal denial was 12 pairs of gloves. Presumably, the gloves would hide the shame of not wearing an engagement ring. In English law, the day February 29 had no legal status, so people believed that traditional customs held no status on that day either. Hence, women were free to reverse the unfair custom that permitted only men to propose marriage. In contemporary times, the idea of a woman proposing to a man at any time during the year is generally acceptable to the masses. Three-quarters of the respondents to a 2014 AP-WE tv poll said it would be fine for the woman to do the proposing, in theory. In the survey, nearly half of single women who hope to get married someday said they would consider proposing. In practice, however, only about 5% of those currently married say the woman proposed, and the figure is no higher among couples wed within the past 10 years. A stigma still seems to linger around the idea of a woman doing the proposing. During the 20th century, postcards, ads and articles would mock women for their aggressive behavior, casting them as desperate and unworthy. But, certainly, times have changed. In 2010's romance/comedy Leap Year, Amy Adams is frustrated when another anniversary passes without a marriage proposal from her boyfriend. Aware of the Irish tradition that allows women to pop the question on Leap Day, she travels to Dublin to track down her fiancé in time to deliver a marriage proposal on February 29.